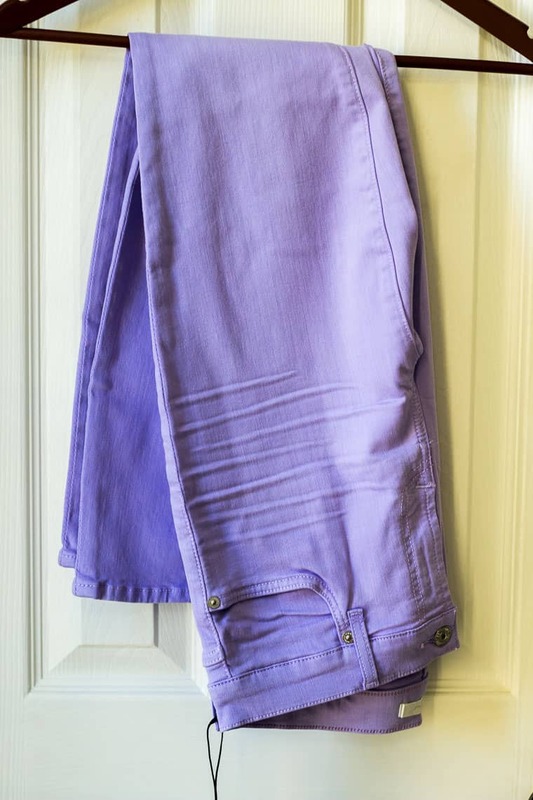 For this April 2019 Trunk Club Review, I requested casual, but pretty clothing pieces that would be great for transitioning into spring. See every piece I received to try on and get all the details on how Trunk Club works! This post contains affiliate and referral links. See our Disclosure Statement for more information. 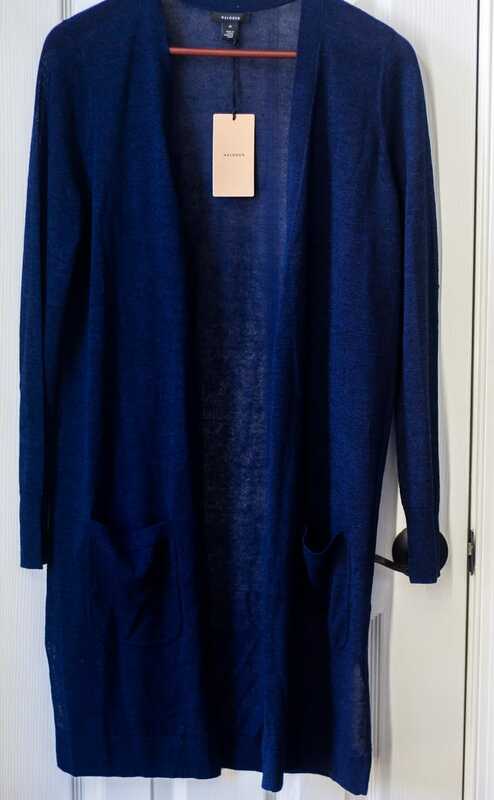 While I usually order a Stitch Fix clothing subscription box once a month, I love to order a box from Trunk Club a few times a year to add some higher quality staples to my wardrobe each season. I’m currently working from home and carting kids around to and from all of their activities, so casual clothes are usually what I request. Casual, but pretty is my go-to request. I am hoping to eventually have my own space for work, but most of the items that Trunk Club sends would work for both circumstances. My stylist always does a great job with trying to meet my requests and sending a variety of items. I usually struggle with fit, but as I leave feedback for items that haven’t worked, it seems she is really catching on to when to size up or down for me. Even though some things didn’t work out for me, almost every item in this trunk fit me great! Before I get into all of the items I received for this April 2019 Trunk Club Review, let me first explain what Trunk Club is all about for those who might not be familiar with the service. If you are already in the know, go ahead and skip this part! 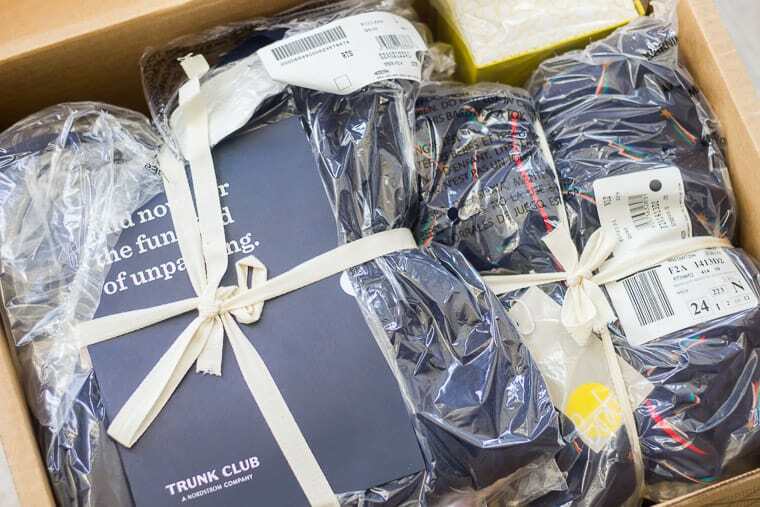 Trunk Club is a clothing subscription by Nordstrom. When you sign up, you’ll fill out a style profile that includes questions about what you like and don’t like. You can also set a price range. Because this is Nordstrom, the price range is moderate to high. You won’t really find budget clothing here. Everything is of good to excellent quality and the same items you will find in-store or online. 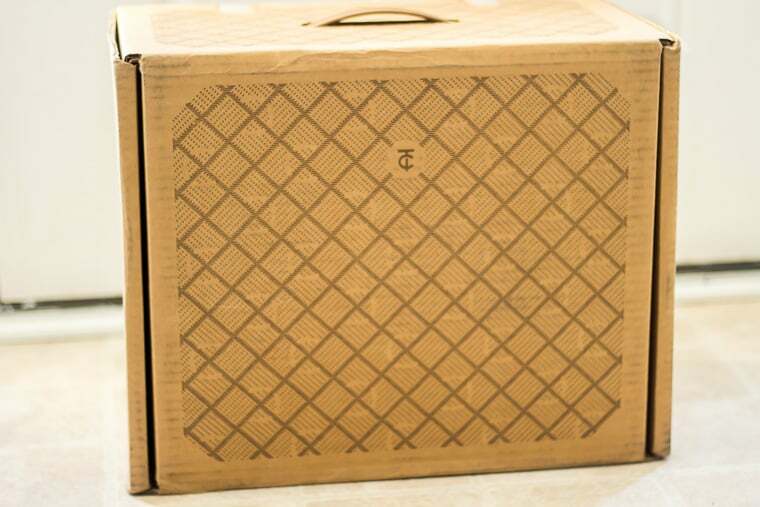 Trunk Club sends around 10-12 items per trunk. You get to preview the chosen items before the trunk ships. If there are items you really don’t like, you can remove them. You can then request new items be added before shipping, or just having what’s left shipped. A unique feature of Trunk Club is that you can request not only clothing and accessories, but intimates, pajamas, and swim suits as well! Why Order from Trunk Club if You Can Just Go in Store or Shop for Yourself Online? The main reason is that it saves you time. Personally, I don’t have a Nordstrom store close by and sorting through thousands of items online is super time consuming. The other reason? You will be paired up with a personal stylist. Trunk Club has a messenger system so that you can actually communicate with your stylist about what types of items you’re looking for. He or she will ask specific questions before choosing items that fit your style and requests. They also give you outfit recommendations for those items. Once your trunk arrives, you try everything on. Keep what you love and return what you don’t. You can also exchange items for different colors and/or sizes! How Do You Return The Items You Don’t Want? Trunk Club supplies you with the return label and tape so that you can return everything in the same box you received it in. Just pack anything you don’t want back into the trunk and keep what you love! You’ll receive an invoice for the items you keep after they receive the trunk back. Be sure to leave feedback on why you love or dislike each item when you’re checking out. How Much Does Trunk Club Cost? When you request your trunk, you can expect to be charged a $25 styling fee. This fee is credited towards anything you purchase. 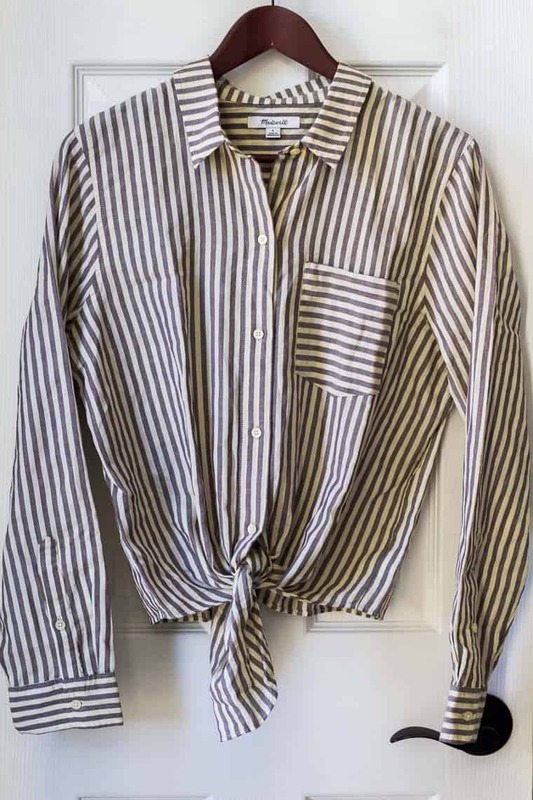 A styling fee is pretty common for clothing subscriptions like this. You should also know that you don’t have to subscribe to regular “trunks.” While you can set up a regular interval, you can also just order a trunk whenever you want. The cost of the items varies greatly! With Nordstrom, the prices are generally in the moderate to high range. Remember, you set your price ranges in the survey and can also reiterate to your stylist what prices you are comfortable paying. Also, be aware that there is no discount for keeping a certain amount of items like with Stitch Fix, but if an item goes on sale before you check out, they do give you the reduced price. This has happened with both trunks that I’ve ordered so far. Now that we have all that down let’s get to the items I received! 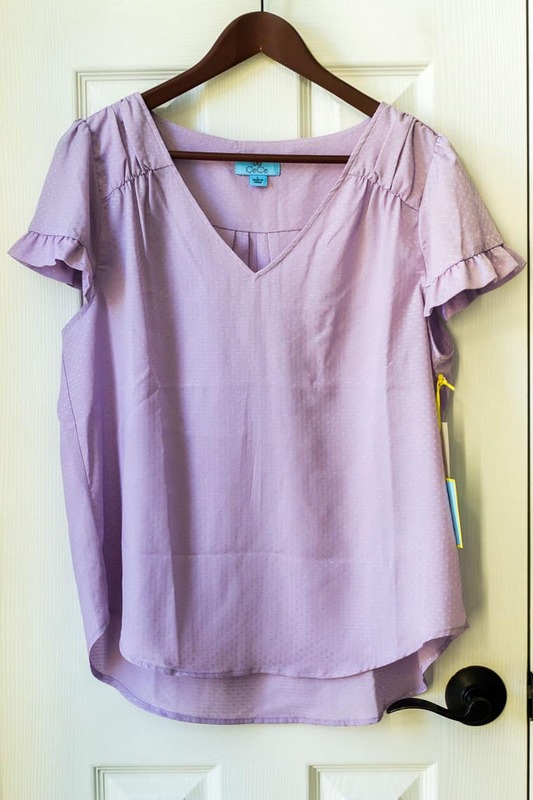 I received a CeCe brand shirt in another trunk (I didn’t review that one) and loved it so much that I had a feeling I would love this one too – especially the on-trend lavender color. It’s just perfect for spring and summer. The shirt itself is very lightweight and satin-y with slightly raised small dots all over it. 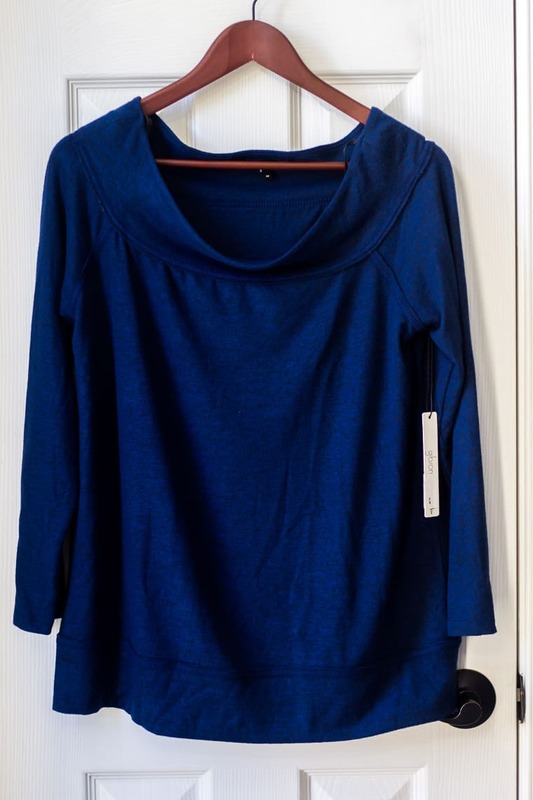 I actually returned this top, but only because I found it on another online retailer for $30 less. Trunk Club only price matches to Nordstrom prices. More lavender! 7 For All Mankind jeans are an old favorite of mine. I can still remember how much better my first pair fit than any other pair of jeans I have ever owned. These days, there are so many great fitting jeans brands that I haven’t splurged on a pair of 7’s for a very long time. Unfortunately, I didn’t splurge on these either. 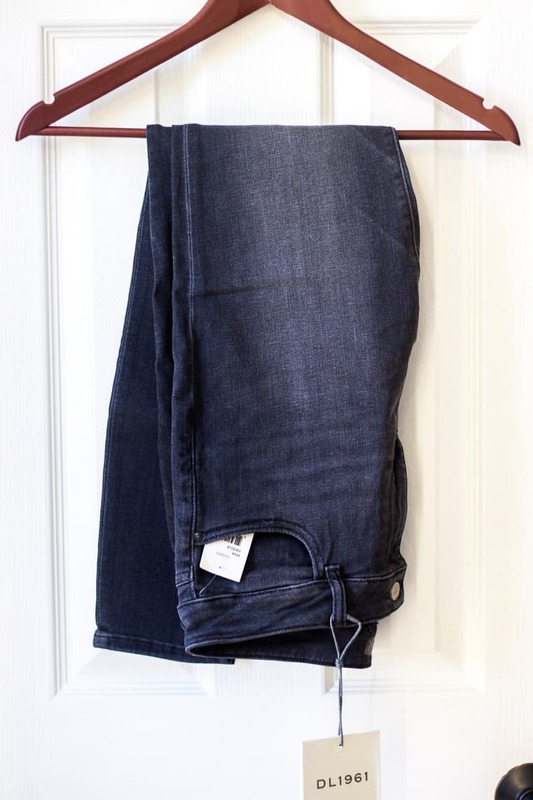 Even though these jeans fit great and I obviously love the color, I just couldn’t bring myself to pay this much for a pair of jeans that won’t be on regular rotation all year long. When I was first looking over the items in my trunk before it was mailed, I didn’t think I’d keep these shoes. I have a couple similar pairs in other colors and the price tag was a little high. I tried them on quickly just to see if they fit, and still thought I’d just return them. But, after trying them on a second time and walking around in them for awhile, I fell in love. They are so comfortable, easy to get on and off, and really cute! 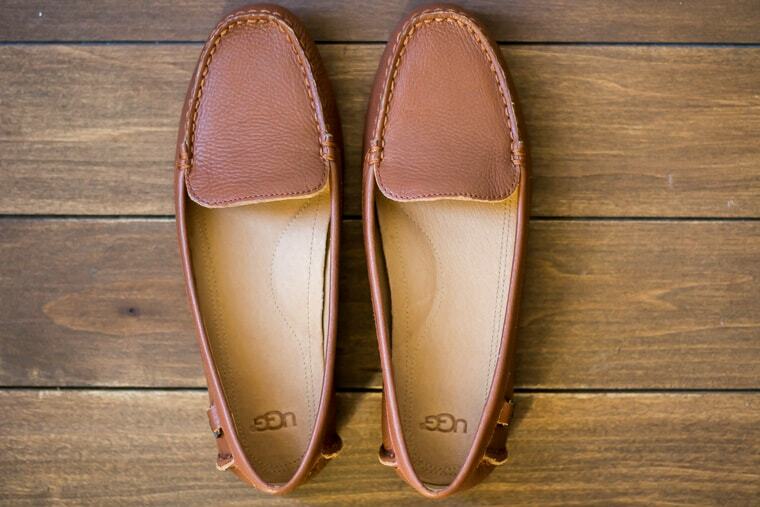 They are perfect for casual looks, business, and when dressing up. I didn’t love this shirt on paper but decided to give it a try hoping it would look better on than it did in images. But, even though this shirt is high quality and well made, it just didn’t work for me. The end of the shirt hit just at the level of my pants, so any slight raise of my arms and my stomach would show – something I don’t really care for. I do like the tie front design though. I haven’t had much luck with rompers and was a bit worried a jumpsuit would fit the same. It didn’t really fit me right. I think my torso must be a tad too long for most items of this design. 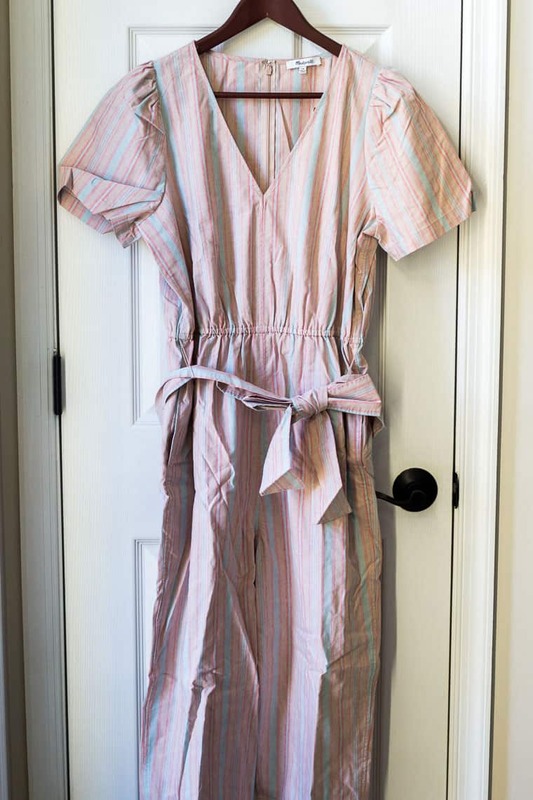 I really, really want a cute romper or jumpsuit. I’m not giving up just yet! This is such a cute staple piece that can be paired with almost anything! It’s a light sweater-like material especially great for the change in seasons. The material is slightly see through but with the right bra or a cardigan or jacket layered over, it’s not a big deal. I think my stylist sent these because I had mentioned that I really needed to replace my decade-old pair of Steve Madden brown leather flats. My old pair of flats are much more casual and these weren’t quite what I had in mind, but I decided to give them a try anyway. This pair fit a little tight on me which is odd. These are my usual size and if anything, I sometimes size down, not up. I didn’t find them to be very comfortable and since they weren’t what I was looking for, I decided to return them. 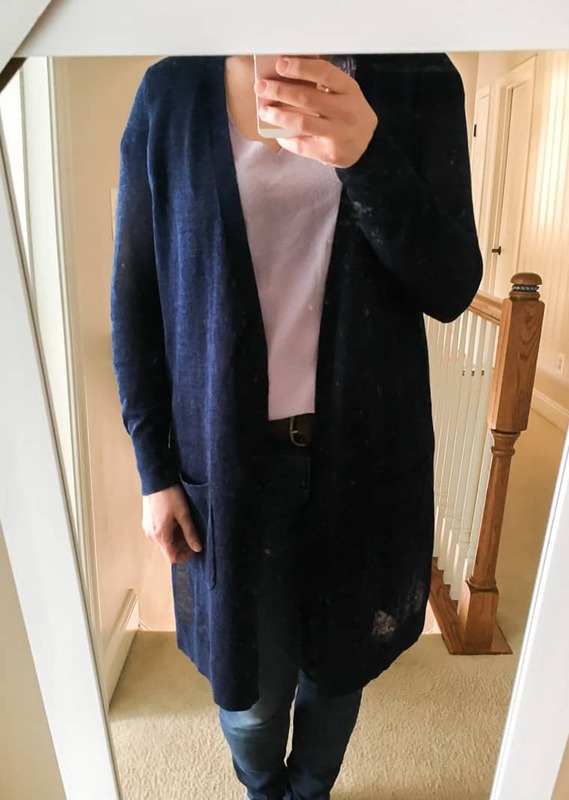 My stylist had originally chosen a cream color for this cardigan, but since I just got one in a recent Stitch Fix box, I changed the color to navy before it shipped. I really love that Trunk Club has this option! 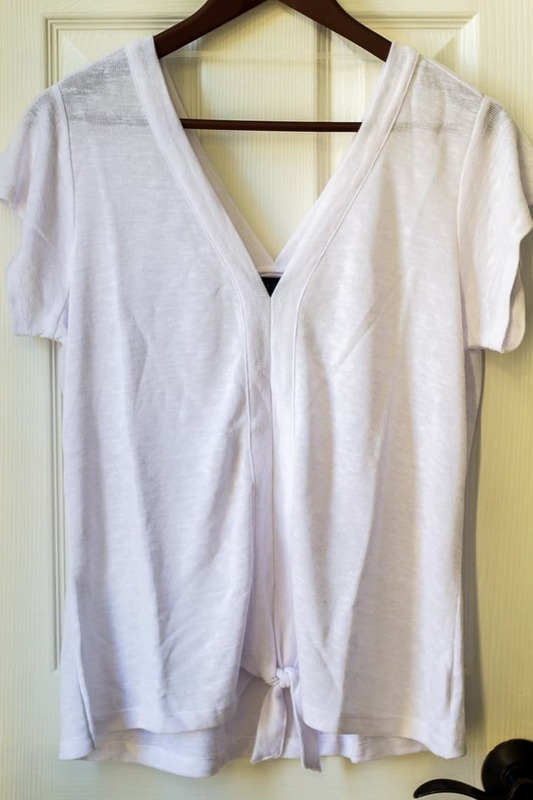 I love these longer cardigans and especially when they are lightweight and easy to layer. This is a great staple piece and a definite keeper! When I first saw this dress online, I thought it would be a great choice for me – especially with the sleeves. 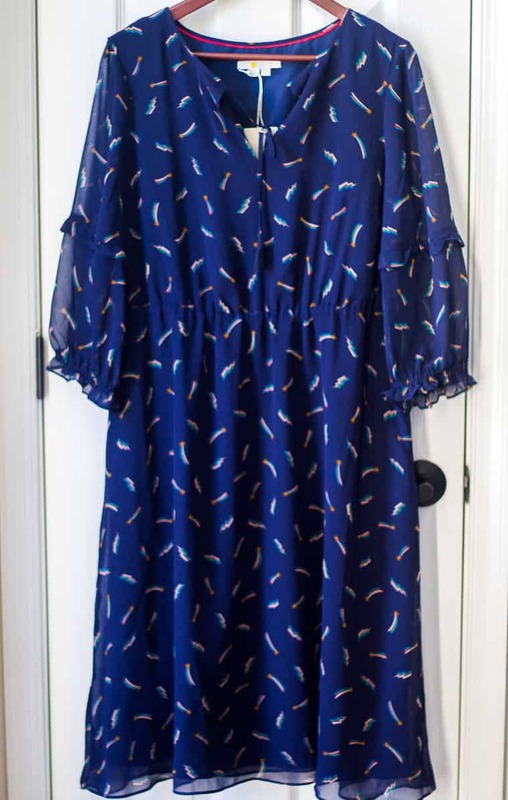 I couldn’t tell what the pattern was on the dress from the image online. When my trunk arrived and I pulled this dress out, it looked really big and kind of frumpy. The pattern is shooting stars and lightening bolts which I thought was a bit different, but not really my thing. After trying it on, my initial opinion of it being big and frumpy didn’t change. It was also an odd length on me and I didn’t feel a smaller size would be any better. 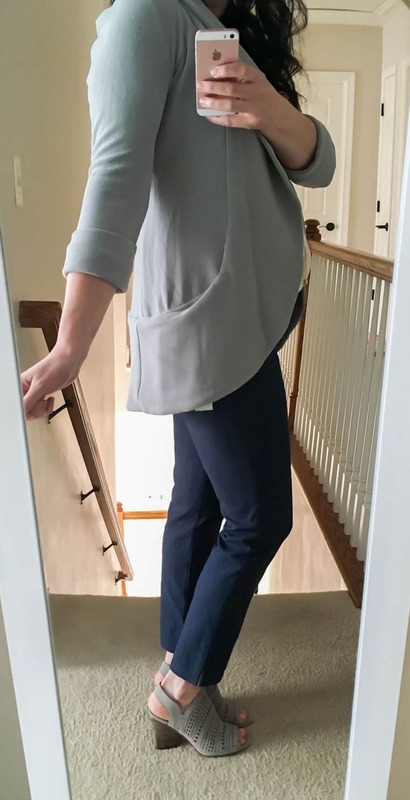 More navy – and I am not mad about it! I forgot how much I love this color. In a past trunk, I kept a different sweater from Gibson because it was so soft and comfortable. It was probably a safe bet to send me another. 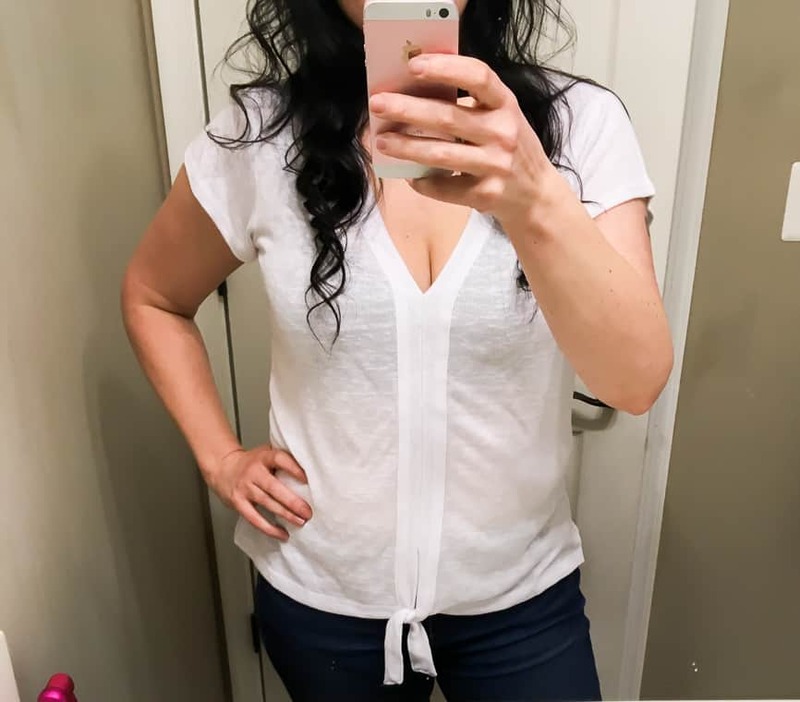 This shirt is also super soft, casual and really cute! I just want to wear it now with cute denim shorts and converse! Since finding the best strapless bra ever, this was a definite keeper for me. My stylist originally chose a peach color of this cuff, but I changed it to ivory before my trunk shipped. I have an ivory pair of Kendra Scott earrings (although one is missing) in a similar color and I thought I’d be able to wear it with more in a neutral color. 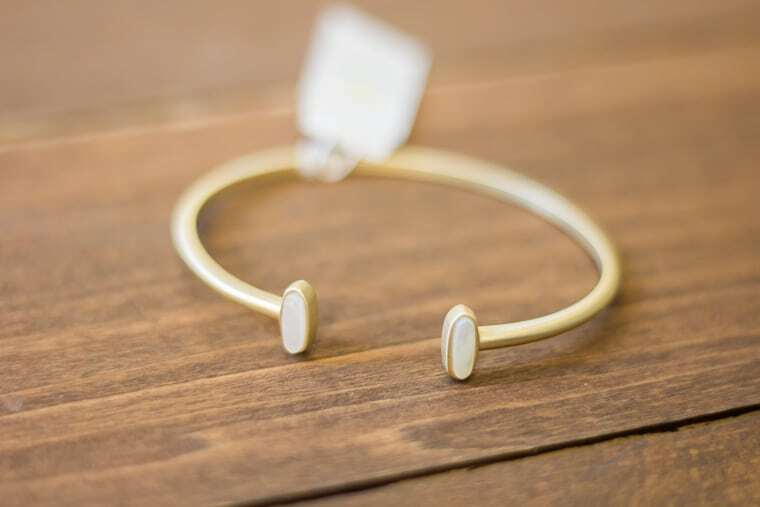 I wouldn’t normally keep jewelry, since I am not in the habit of wearing any since having my youngest son, but I am trying to get back into the routine of getting myself together more often again. When I was first looking over my trunk, I removed a couple of items that I didn’t want sent. My stylist replaced those items before shipping the trunk. These jeans were added, so I couldn’t change the color or deny them being sent. I already have pair of jeans in a very similar color that I rarely wear, so I didn’t think I’d want to keep these either. I was afraid after trying them on I’d want to keep them, but even though they fit amazing, I really just didn’t want this color. They are also crazy expensive so I would only spend this much on jeans if I actually had this much to spend and was going to wear them all of the time. Overall, I was really happy with the items that my stylist chose for me. She did a great job sending items that fit my request for pretty, casual spring pieces. 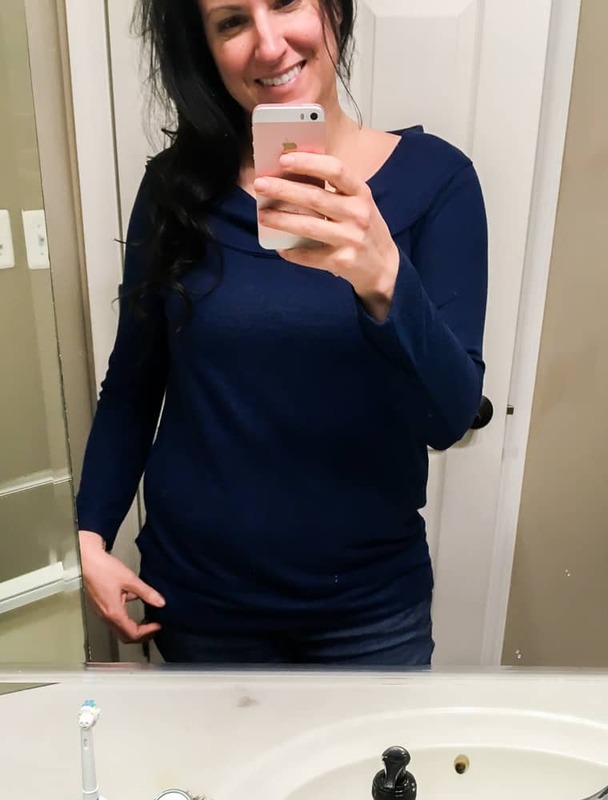 While fit is almost always an issue for me, this time around it was much better! I really do love Trunk Club. The ability to communicate with the stylist, the quality of the clothing, and the convenience are all huge benefits of this service. I may request another box closer to summer, and if not, then most definitely fall – my favorite season of all! Does this April 2019 Trunk Club Review have you convinced to give the service a try? If so, you can get started by clicking here!